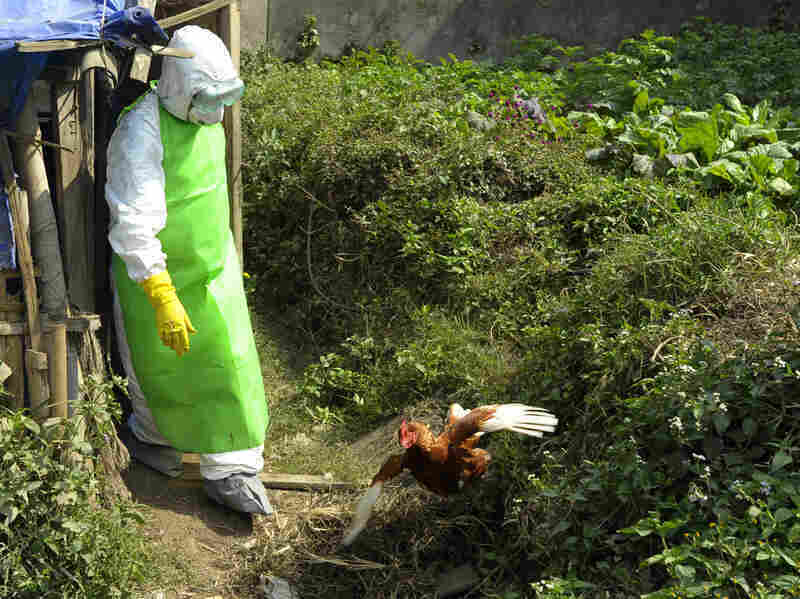 Health workers in Nepal culled chickens and destroyed eggs following an outbreak of bird flu in Kathmandu in October 2012. Controversial experiments on bird flu could resume within weeks because leading influenza researchers around the world have finally called a halt to an unusual moratorium that has lasted more than a year. The voluntary pause in the research started back in January 2012. Scientists had genetically altered the bird flu virus H5N1, changing it in ways that allowed it to spread through the coughs and sneezes of ferrets — the lab stand-in for people. But the experiments caused a public outcry. Critics charged that if the man-made viruses ever got out of the lab, they could be contagious in humans and start a deadly pandemic. Virologist Ron Fouchier of Erasmus Medical Center in the Netherlands, whose lab did some of these experiments, says weighing the risks and benefits of this research isn't easy. "But it's clear that all of the 40 people who announced the moratorium in January 2012 have now signed to restart the work," he says. "That means that 40 of the world's leading experts in influenza research seem to think that the benefits outweigh the risks." A letter announcing the end to the moratorium is being published jointly in the journals Science and Nature. The experiments were part of an effort to understand how the H5N1 bird flu virus might mutate and start spreading in humans. H5N1 circulates in poultry in parts of Asia and the Middle East. It rarely makes people sick, but over half of those known to have gotten sick from the virus have died. Understanding the mutations that might make the virus contagious in people is essential for efforts to prepare for a potential pandemic that could emerge naturally in the future, the researchers say in their letter ending the moratorium. They add that "researchers who have approval from their governments and institutions to conduct this research safely, under appropriate biosafety and biosecurity conditions, have a public-health responsibility to resume this important work." "The risk exists in nature already, and not doing the research is really putting us in danger," says Yoshihiro Kawaoka of the University of Wisconsin-Madison, who also did some of the original experiments. The U.S. government is still finalizing its guidelines for what kinds of H5N1 transmission experiments could be done with federal money in the future, and under what lab conditions, so scientists like Kawaoka who get this kind of government funding can't yet restart their studies. Fouchier also receives U.S. funding for his lab in the Netherlands, but he says he has money from other sources that he can use to resume his experiments there and will do so, probably in the next few weeks. "It's going to take some time to restart, but it certainly will not take months for us to restart," says Fouchier. Not every one welcomed the news. "I don't think they should resume. I think the moratorium should go on. Because I think a number of questions remain unanswered," says Tom Inglesby, director of the Center for Biosecurity of the University of Pittsburgh Medical Center. "Should we start to feel anxious if we hear that 10 new labs are doing this work in the world two years from now? Or 100 labs doing this work five years from now?" asks Inglesby. He worries about the risk that a genetically modified flu virus might escape the lab and infect millions. "Would that be a problem for the flu virus community? I don't think we've established those guidelines yet," he says. Inglesby also questioned whether these experiments are really necessary for activities like making new vaccines and keeping watch for an emerging pandemic. "There could be a time in the future where there is a highly compelling rationale to proceed which justifies the risks. I just personally have not seen that yet," he says. Fouchier says, however, that given all the public discussion and debate over the last year, the aims of the voluntary moratorium have been met. Although the U.S. government is still considering what to do about this issue, researchers around the world did not want to wait, he says, in part because officials have been unclear about how much longer their decision-making process will take. "It might take another one, two, three years," says Fouchier. "So, how long do you want us to wait?"